Measurements are 46" x 29"
Used by Crusader Templar Knights around the 12th century. Knights were sometimes identified by their shields, as their faces were covered in battle. 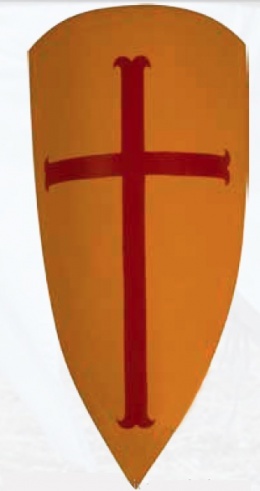 Our version, classic kite shield, is made of wood, with linen layering and is hand painted, with the typical red cross charge emblazoned on a bright yellow field. It also includes leather covered arm padding, leather arm and shoulder straps. The shield does have a bit of curve to it, measuring 46" x 29". This page was last modified on 19 May 2014, at 19:07.